Through our Planners4Health project, Hawaii Planners4Health aimed to assess the capacity, interest, and needs of planners across the state to improve the healthy planning field in Hawaii. As a part of this process, we designed a survey to understand to capture baseline data — and engaged Mark Fenton, a nationally recognized consultant, to tailor training for each county. To ensure that we met the unique needs of each site, we held held multiple phone conversations around what a meaningful workshop, training, or meeting would look like. On Kauai, we made sure to include walk audit trainings for the county planners and Department of Public Works engineers and an interdepartmental workshop. Not only did these trainings inform planners about the connections between the built environment and health, the trainings provided attendees with the tools to highlight the connections between design and health in the spaces they live, work and play. The experience will greatly benefit the planners as they wrap up their general plan and initiate the West Kauai Community Plan, covering areas including where we held the walk audit trainings. 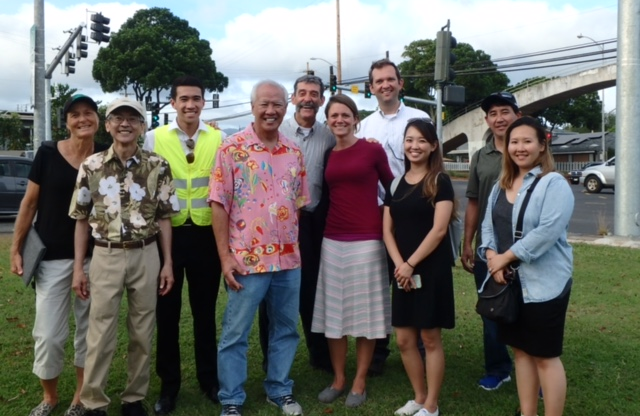 On Maui, the county team and task force agreed to hold walk audits on the west side of Maui, with an additional training of planning leadership and staff. The county team also invited Mark Fenton to present to the policy board of the Maui Metropolitan Planning Organization. Not only do we anticipate the walk audits and respective training will have a positive impact on the update to the West Maui Plan, our hope is that the experience will inform Safe Routes to School efforts and additional work being done between the county and the local health coalition. 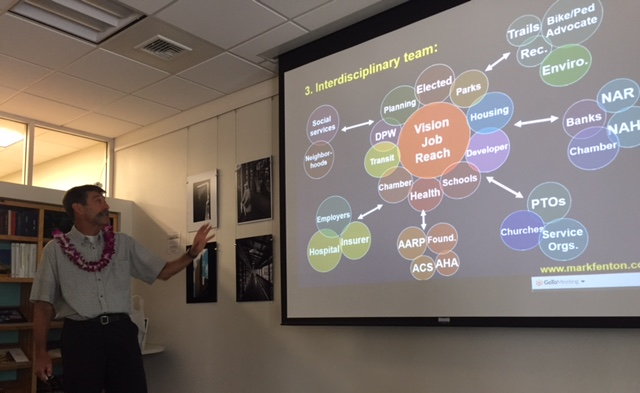 Planners4Health consultant, Mark Fenton, shares his expertise with the Hawaii task force. Photo courtesy Hawaii Planners4Health Task Force. On Big Island (Hawaii County), we conducted a walk audit in Kona, with a team representing health, the planning commission, and community coalitions. The focus of the audit was Ali’i Drive — and how improvements could benefit all users and modes. The following day, our consultant had a meeting with Hawaii County Department of Public Works. This meeting not only acknowledged the tremendous accomplishments of the county, but also discussed the ways in which the engineers could support the healthy community design efforts of the local planners by reassessing certain stances and guidelines. Our hope is that this conversation may facilitate cross-department collaboration. Our efforts on Oahu have already had impact. Events on this island included: walk audits in Downtown Honolulu as well as Aiea and presentations to the Public Health, Safety and Welfare Committee as well as the Chronic Disease Prevention and Health Promotion Division of the Hawaii State Department of Health. Hawaii Planners4Health Task Force. Photo courtesy Hawaii Planners4Health Task Force. Not only did these discussions and gatherings bring together health and planning in assessments of existing community design — and prompt conversations around working together to improve it — the tailored trainings also helped those working in health better understand the connections to what they do to the environment that planners shape. We continue to work with these stakeholders and partners in the hope that these energies continue collaborative efforts around healthy community design. Top image: The focus of the walk audit in Kona was Ali'i Drive. Photo by Flickr user sk (CC BY-ND 2.0). Danielle Schaeffner, MPH, is an environmental change specialist in the Chronic Disease Prevention and Health Promotion Division of the Hawaii State Department of Health. Schaeffner started working in active transportation in Washington State where she worked at Kitsap County Health District as the Built Environment Lead from 2014–2016. She is a task force member and the project manager for the Hawaii Planners4Health program. Schaeffner graduated from the Rollins School of Public Health in 2012 with an MPH in Epidemiology.